Lambert, like Mercury, is a flamboyant pop star. When Paul Rodgers fronted Queen and you had a rock star out front of a rock band, the recipe wasn’t right. Robbie Williams had the pop but not the flamboyance when he recorded ‘We Are The Champions’ with Queen. The selection of Lambert came after a lot of trial and error but they finally got it right. Adam Lambert does Freddie Mercury more convincingly than he does Adam Lambert. It all comes down to the songs. Queen songs are a collection of some of the greatest rock songs of all-time. With the exception of the Pink song Lambert recorded (that really was a waste of space) this show was a perfect rock concert. Queen is a sound. Brian May’s guitar and Roger Taylor’s drums are just part of that sound. Their songwriting genius is even more important and that is what you get at a Queen show. This is hit after hit after hit after hit. The Queen setlist as a document of rock history. Queen was a team of individual songwriters who worked as a team of musicians. Mercury, May, Deacon and Taylor were four equal parts. I was actually surprised that founding member John Deacon, who retired from Queen and the music industry in 1997, didn’t rate a mention all night. The number of time Freddie featured paid honour to his legacy but an acknowledge of the work of Deacon would not have gone astray. ‘Love Of My Life’, the May/Mercury collaboration on video with Brian performing from the front of the catwalk was a focal moment. Deacon’s songs are the ones with the dominant bass-line. Two of his instantly identifiable classics, ‘Another One Bites The Dust’ and ‘I Want To Break Free’, are showcased in the setlist. ‘You’re My Best Friend’, another of Deacon’s songs, hasn’t been played live by Queen since 1980. There were seven songs on this tour that you did not hear live on the last Queen + Adam Lambert show in 2014. ‘Hammer To Fall’, ‘Don’t Stop Me Now’, ‘Bicycle Race’, ‘I’m In Love With My Car’, ‘Get Down Make Love’, ‘A Kind of Magic’ and that strange choice of Pink-penned Lambert song to this tour. Scratched from the last tour were ‘Now I’m Here’, ‘In The Lap of the Gods Revisited’, ‘Seven Seas of Rhye’, ‘39’, ‘These Are The Days Of Our Lives’, ‘Dragon Attack’, ‘The Show Must Go On’ and ‘Last Horizon’. The main robot imagery of the current tour comes via the sixth album, News Of The World, with the band using an animated version of the alternative cover as their opening visuals. This time around no songs were represented from the first two albums. 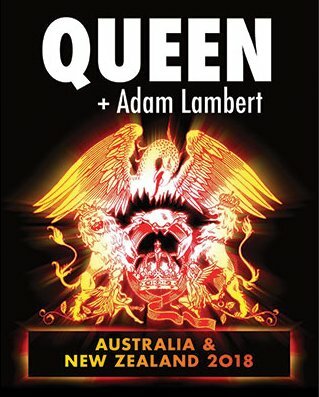 Instead this setlist picks up after album three, Sheer Heart Attack, with ‘Stone Cold Crazy’ and ‘Killer Queen’. Brian May did make mention of that fateful first tour when they were booed off stage at Sunbury in 1974 with chants of “go back to Pommyland, ya pooftahs”. The Australian audience of 2018 is much more refined than their yobbo ancestors of the 70s. Queen + Adam Lambert is Queen honouring Queen. Brian May and Roger Taylor have done an incredible job keeping the legacy of Queen alive, in concert, in theatre with ‘We Will Rock You’ and in experience ‘The Queen Extravaganza’. In laying down the groundwork over the past 20 years, Queen have established the formula for future generations to hear their music live as it was intended. At least for now, we still get to see two of the founders performing the songs they created.